Are Emerging Markets Still An Asset Class? The majority of the components are sensitive to external forces that will have a similar impact across the board (i.e., an oil price shock). Investors impose a self-reinforcing consistency in the way the different parts of the asset class relate to one another. EM has grown markedly since its relatively modest beginnings, and it now contains far too much diversity to meet the first requirement of shared characteristics. It no longer qualifies for the second criterion, especially now that the comments and actions of a single policy-making body, such as the International Monetary Fund, don’t move markets as they once did. The third characteristic — the propensity of investors to look at such an asset class as a unit rather than as the sum of its parts — still plays a role, giving rise to interesting dynamics. The asset class should offer diversification and correlation benefits but I acknowledge the risk factors and the relationships between asset classes can and will change over time. Asset classes and their risk characteristics should be different from one another. This could includes differences in geography, economic development, security structure, risk factors, income payments or investment styles. The asset class should have an expected long-term return above inflation. Do emerging markets still fit the bill here? I think so. The MSCI EM Index is made up of countries in Asia, Europe, Africa and Latin America. With developing economies I think this type of diversity among regions is a positive since it’s difficult to know which countries will make the leap and which ones will be left behind. Emerging markets have outperformed both the S&P 500 and the MSCI EAFE over the past 10 years ending in 2014 but they did so with almost double the volatility. In a feast of famine fashion, emerging markets provided a nice boost to returns in the mid-2000s, were the big losers in the 2008 crash, led the recovery in 2009 and have since lagged developed markets. 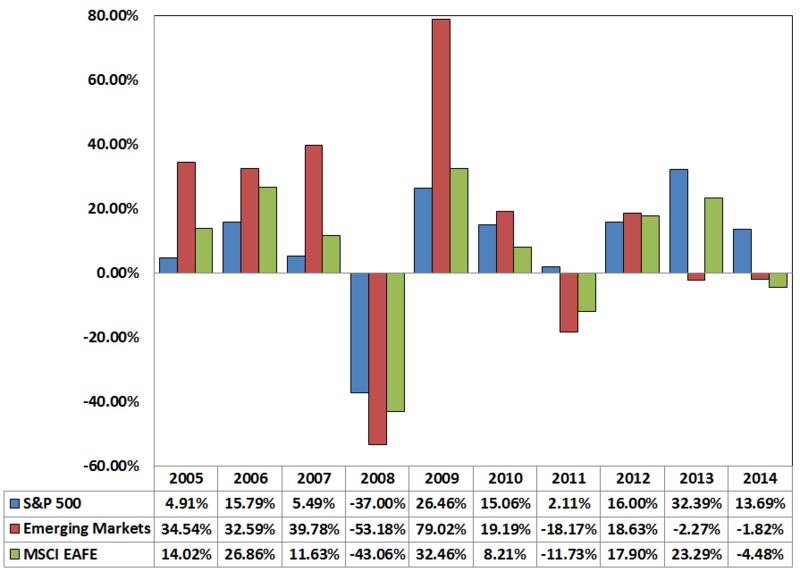 The diversification benefits are apparent from these performance numbers. While it never comes close to going negative, you can see the correlation between the two asset classes is constantly changing. This is what you want to see between assert classes in a diversified portfolio. It allows investors to take advantage of volatility by rebalancing or putting new savings to work at lower prices in some parts of their portfolio. If you look at total world stock market fund, emerging markets make up roughly 10% of the total market cap. Yet emerging markets now make up closer to 40% of world GDP. You could try to pick the winners and losers from this group, but it’s not going to be easy. Remember when everyone was convinced the BRICs were the hottest place to invest? The biggest BRIC ETF (ticker: BKF) is down almost 32% since its 2008 rollout. The simple Vanguard EM Index ETF (VWO) is down less than 8% since then. That’s an outperformance of 4.2% per year. Most professional investors benchmark their foreign stock allocation to the MSCI EAFE and then break down their funds or stocks further by region or country. But from an overall asset class perspective, this is still the benchmark the majority of investors choose to follow. I don’t see this changing anytime soon. I think the same applies for the broader emerging markets. EM offers a diversification of risk, returns, economic growth, geographic regions and investor appetite for risk. Some of these countries and regions will outperform. Certain investors will be able to pick the winners. Many will fail. A broad, diversified approach is still probably the best option for the majority of investors that don’t have the skill-set or expertise to be able to analyze the different emerging market countries. Emerging markets will continue to go through periods of extreme volatility. There will be future crises, currency problems, inflation and recessions. This is par for the course. If you’re willing to accept how emerging markets behave, I still think they represent an asset class in a diversified portfolio. Some investors can’t handle EM as an asset class and that’s okay too. But I think there are going to be a ton of opportunities in the years ahead as these countries mature. Any comment on Frontier Markets being an asset class? Good question. There’s definitely going to be some opportunities in that area as well, especially Africa IMO…eventually. I would lump in frontier markets w/EM. Does an investor need FM in a portfolio? I’m not so sure. For those that are able to handle the wild swings I can see using a small part of your EM exposure in FM. Or you could wait to see who the winners are that will eventually move into the EM indexes. What about your point number three above? 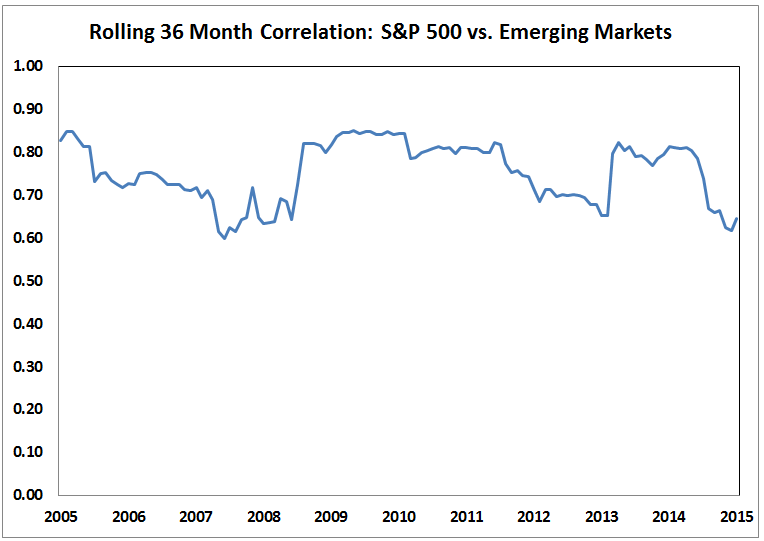 By investing in Emerging Markets you are arguably exposed to Emerging Market inflation, too. Once you adjust for inflation, the picture looks less pretty. So a lot of historic EM returns might actually be money illusion. This is not to say, there is no merit in investing in EM, but inflation should be considered. Great question. If you look at the data, since the 1988 inception, EM equities priced in USD have delivered 8.6% real annual returns above inflation (obviously before fees, taxes, etc). The thing is that inflation is just one component to think about. It affects earnings, dividend yields, currency fluctuations, wages and much more. I’m not saying all of this always balances out and it’s always going to be a positive, but you can’t just look at inflation in a vacuum. Thanks for your reply. Just out of curiosity, what EM inflation data did you use? Of course, inflation has broad implications. However, when looking at EM investments, we should probably look at assets that offer an excess return over (elevated in comparison to DM) inflation compensation. In other words, EM assets have to offer an elevated expected nominal return, as EM inflation tends to be higher and only the return in excess of that represent a real return to the investor. These are actually EM returns in USD for a US investor so I used US inflation. I don’t have the data on how it looks from the perspective of an EM investor. That makes sense to me that EM would have to offer a higher risk premium to account for sovereign & inflation risk. Regarding the relevant inflation rate, I’d suggest to consider local inflation, whenever making a local currency investment. Of course, you could hedge the currency exposure, and there you would see the impact too due to the interest rate differential. A while back I tried to do a quick back on the envelope calculation for stocks using IMF data for EM inflation, not sure if the weighting method is comparable to the MSCI EM, but it should at least give us a reasonable idea. And the results were not pretty at all.